Iran's new president was a member of the hard-line Islamic student group that seized the U.S. Embassy in Tehran in 1979, but he opposed the takeover — preferring instead to target the Soviet Embassy, friends and former hostage-takers said Thursday. The former students who carried out the seizure and held the Americans for 444 days said Mahmoud Ahmadinejad had no role in taking the embassy or guarding the hostages. In the turbulent early days of Iran's Islamic Revolution, Ahmadinejad was more concerned with putting down leftists and communists at universities than striking at Americans, they said. During the long standoff, he was writing and speaking against leftist students, they said. At least one member of the current Iranian government definitely was involved in the hostage crisis. The current Iranian environment minister, Massoumeh Ebtekar, was the chief interpreter and spokeswoman for the radical students who took over the U.S. Embassy and held 52 Americans hostage for 444 days. Talk about the "who's who" of Iranians who in 1979 and 1980 seized and held the American hostages in Tehran began on Wednesday, when five former U.S. hostages who saw Iranian President-elect Mahmoud Ahmadinejad in photos or on television said they believe he was among the hostage-takers. One said he was interrogated by Ahmadinejad. "If he died his hair blond and shaved his beard I could still spot him," former hostage Chuck Scott told CBS News. Scott says Ahmadinejad was an especially brutal leader among the militants, a man who blasted his own guards for showing the Americans any kindness. "He went into a rage right there and said 'you can't do that.' These people are animals. They are pigs. The only time they should ever get out of their cells is when they are taken out for execution," Scott told CBS News Correspondent Jim Acosta. "Yeah, I recognize him too,'' former hostage Dave Roeder told CBS News. "And he was in fact present at one of my interrogations." The White House said Thursday it was taking their statements seriously. President Bush said "many questions" were raised by the allegations. The flap could add another layer of mistrust between the United States and the former Tehran mayor, who was elected president last week with the backing of some of the most hard-core members of the Islamic regime. The White House is taking a "wait and see" approach to the controversy, reports CBS News White House correspondent John Roberts. The administration expects to get a clearer picture of what to expect from Ahmadinejad in July, when Iran is set to resume negotiations about its nuclear program with European nations. Leaders of the Office of Strengthening Unity, the radical Islamic student group that carried out the Nov. 4, 1979, takeover of the embassy, said Ahmadinejad was not among the hostage-takers. "He was not part of us. He played no role in the seizure," Abbas Abdi, one of six leaders of the group, told The Associated Press. Mohsen Mirdamadi, leader of the students who swept into the embassy, also said Ahmadinejad was not involved. Abdi and Mirdamadi are now leading proponents of reform that would support democratic changes and are at loggerheads with Ahmadinejad. Mohammad Ali Sayed Nejad, a friend of the president-elect, said he and Ahmadinejad were the only two members of the Office of Strengthening Unity who opposed taking the U.S. Embassy. "While the bulk of student leaders planned and took part in the seizure of the U.S. Den of Spies (U.S. Embassy), we two were extremely worried about communist groups," Sayed Nejad said. He and Ahmadinejad unsuccessfully argued in favor of seizing the Soviet Embassy, and Ahmadinejad told colleagues in a recent meeting he opposed targeting the American mission because it would bring international condemnation down on Iran. "I believed that if we did that, the world would swallow us," he said, according to Meisan Rowhani, an aide who was at the meeting. Ahmadinejad dropped his opposition to the U.S. Embassy takeover after the revolution's leader, Ayatollah Ruhollah Khomeini, expressed support for it, but he never participated, said Rowhani. The Office of Strengthening Unity was formed before the embassy takeover, and its main goal was to support Khomeini's bid to impose an Islamic government after the removal of the U.S.-backed Shah Mohammed Reza Pahlavi. The embassy takeover galvanized the Islamic factions. The embassy became a focal point for Islamic supporters; hundreds of students, even those not directly involved in the holding of the hostages, had access to the embassy. Rasool Nafisi, a Middle East analyst who studies conservative groups in Iran, said that Ahmadinejad was a founder of the Office of Strengthening Unity, but the group decided that taking over the embassy was the wrong policy. A group of students that separated themselves from the office planned and carried out the takeover, he said. Nafisi said Ahmadinejad was not one of those who separated from the original organization, but may have frequented the embassy as one of the thousands of the students who camped out or were involved in protests there. Former American hostages Chuck Scott, David Roeder, William J. Daugherty and Don A. Sharer told AP that after seeing Ahmadinejad on television, they were certain he was one of the hostage-takers. A fifth ex-hostage, Kevin Hermening, said he reached the same conclusion after looking at photos. "I can absolutely guarantee you he was not only one of the hostage-takers, he was present at my personal interrogation," Roeder told AP in an interview from his home in Pinehurst, N.C., though he added, "It's sort of more mannerisms." Daugherty and Sharer said they believe Ahmadinejad is shown in two AP photos taken a few days after the embassy was seized. One photo show a blindfolded American being led on either side by two bearded men. 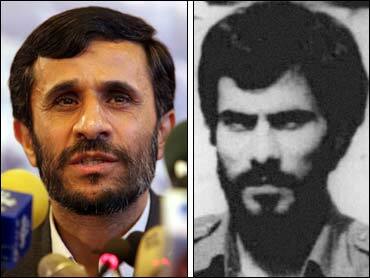 The two former hostages said one of the men resembles Ahmadinejad. Abdi and several other former hostage-takers were shown the same photos and said they did not believe the man was Ahmadinejad. "I don't think it even resembles him," said Abdi. Members of Ahmadinejad's office refused to look at the photos or comment on the allegations, and guards prevented AP from entering Ahmadinejad's office to present the photos. A picture on Ahmadinejad's campaign Web site shows the president-elect at college age. His features are softer than the man in the photo, his hair and mustache thinner and beard shorter. Bijan Adibi, another former hostage-taker, also viewed the photos and didn't believe it was Ahmadinejad. He noted the man in the picture is about the same height as everyone else in it, including the American. Adibi said Ahmadinejad is a little shorter than him — and Adibi stands at about 5 feet 2 inches. "For many other reasons, I am certain that this picture is not Ahmadinejad," Adibi said.